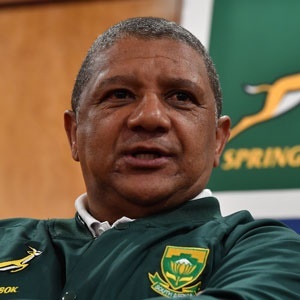 Cape Town - The scoreboard tells a different story, but coach Allister Coetzee believes that the Italian team that his Springboks beat 35-6 on Saturday was an improved outfit from the one that stunned the Boks 20-18 in Florence last year. It was a puzzling statement from the Bok coach, who praised the improvement his side has shown this year. Italy on Saturday were simply never in the game as the Boks rolled back the years to crash and bash their way to a comfortable victory that was the result of a dominant display from the forward pack. "This is a completely new Italian side and it's a very good Italian side ... better than the one we played last year," Coetzee said. "I can see the improvement in the Italian side." Instead, Coetzee said, Saturday was a case of the Boks having improved rather than Italy being worse. "There has been a lot of change from last year and this is a new team entirely," Coetzee said of his Boks. "There is a great team environment, a completely new culture, our players are much better conditioned and we had numerous camps this year where we could put our plans in place. "It's a combination of things ... the systems are really working well for us and it gives the players a lot of confidence to just go and play because the plan is in place." Coetzee is still considered under massive pressure in terms of holding onto hiss job. The 38-3 loss to Ireland in the first game of the tour was reportedly the last straw for SA Rugby's bosses, but since then the Boks have been on an upward curve. "The most important thing for us on this tour is that we've learnt how to play in these conditions," he said. "I'm just happy that the team has learnt from the Irish game and the French Test and that they were able to put it in place tonight ... I'm really pleased with the side's performance." The Boks now take on Wales at the Principality Stadium. Kick-off is at 16:30.